Lyonel Bauchet's The Secret Society respects the precepts of DiN's label of contemporary EM; aeither be a dark and experimental music which oscillates between stagnant rhythms and ambiances on dark and experimental structures. Rhythms more implosives than explosives with reminiscences as eclectic as Tangerine Dream and Autechre while passing by Spyra and Namlook, here is of what is made this first opus of the synthesist of France. Far from being a newcomer in the universe of contemporary EM, Lyonel Bauchet possesses a vast experience at the musical level, having composed more than 2000 musical pieces for television, cinema and radio. 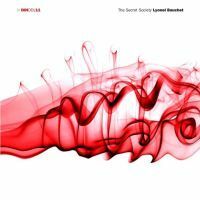 But he haven't produced an album until then and it's to Ian Boddy that we owe this small jewel which is The Secret Society. While taming the complex and immense Buchla 200e modular synthesizer, Bauchet drawn the interest of Ian Boddy. He posted clips on Internet while explaining the process of his learning when the founder of DiN noticed him and invited him to realize his first opus. A first opus which lets glimpse interesting future prospects, as much as for us as for Lyonel Bauchet. A metallic veil pierces the silence. A fine pulsation emerges from it, introducing The Secret Society's first stammering. Weaved in an intriguing and mysterious approach, where the indefinite rhythm beats on arrhythmic pulsations and felted percussions, "Secret Introductory March to the Society" progress in an ambiance in suspension. Ringing as Tibetan as abyssal, chthonian choirs, lugubrious mist and sinuous threatening reverberations decorate the sound setting of this track which tergiversates constantly between its ambiances and torments. A premise that will follow throughout The Secret Society. More livened up, "Lifeworld" moves in a nebulous ambiance, although its rhythmic structure is more insidious and hybrid. A somber and slow structure which progresses in a veiled approach with frenzied pulsations/percussions pounding and galloping on a circular rhythm to polymorphic core. A rhythm which increases constantly its strength with a tangent vitamined by tribal percussions, it slides towards a dark techno, kind of Juno Reactor style, to judder of a dislocated pace initiated by an array of tribal and metallic percussions. In another register, "Ocean Spleen" is a dark ambient with heavy wrapping synth waves, while "Pavane K4816" proposes a slightly more lively structure. It’s an experimental and lugubrious electronic ballad which evolves slowly on an ascending structure seasoned by tenebrous winds, sinister droning and a mephistophelic mist which wraps mislaid keyboards and\or electric piano chords and riffs. "So Much for Subtlety" is superb and catchy with its limpid arpeggios which ring and float slowly on a hatched circular structure. For a short track Lyonel Bauchet deploys it all on this melody fragmented in a shadowy eclectic universe and strongly livened up by good percussions which hammer a stroboscopic structure where the composite rhythms push the hammer of our eardrums. Dark and in a constant and subtle evolution "Each Will Have His Personal Rocket" is a slow procession of an ambiguous and hesitating rhythm. The intro is obscure, even black, and progresses with pulsations which increase constantly their rhythmic duels beneath glaucous breeze, black winds ululating such as sirens and a bass line to humming notes. In mid-term the percussions bind themselves in this slow rhythmic procession. The tempo progresses then with the rollings of the electronic skins and a more spasmodic rhythm which gesticulates awkwardly under somber and icy synth winds. Another catchy track, but for totally different reasons, "Dawn" is the another jewel which will please undoubtedly fans of Tangerine Dream and sequences rolling as balls in Hyperborea and Poland albums. Superb, these sequences roll and follow a very nice oscillating curve beneath suave synth breezes, bringing us to memories of a good Tangerine Dream era. It’s a very great track which precedes the not less delicious "Blissfully Ours" which is as much catchy and inviting to stamp foot as "So Much for Subtlety", except the structure is curt and hatched. Another catchy tune than we don’t get tired to listening to, "Thank you and Good Night" closes The Secret Society with a supple tempo of which curves and elastic loops hang on to iridescent droning as well as to superb percussions. Percussions which shape a mesmerizing rhythmic canvas and of which clear and resonant knocks announce nice rhythmic modulations. Penetrating, the synth throws great layers as ethereal as wrapping, crossing at random lonely riffs and winds. It’ a great conclusion for an album to the antipodes of rhythms, influences and melodies. I liked Lyonel Bauchet’s first opus. Navigating on several influences and rhythmic approaches, The Secret Society touches all the spheres and possibilities of styles that EM and synthesizers can influence. And spread out over 60 minutes, we have to admit that the variety is such that we have to quench our urge for exploration on several listening and still. Available in downloadable on the DiN website (http: // www.din.org.uk/), The Secret Society guaranteed you 60 minutes of pure magic and all the happiness which is linked with it.